I have tried machine applique. I have only been quilting since 2011. My best tip so far is to use Best Press spray starch to get everything nice and flat before stitching. Thanks for the chance to win! Your block is very pretty! I just finished a baby quilt with applique, and loved doing it! I have done some machine applique I don't have any tips for you, sorry. I'm still learning myself. I really like your block and I agree that it would make a wonderful baby quilt! I've not done much machine applique but my daughter bought me a clear applique foot for my machine so I need to try again. Your block is lovely and congratulations on being included in the magazine. You've inspired me to try my applique again. I've done a little machine applique but I'm very slow!! Your block is wonderful. I love the colours you choose. I try one machine quilting but I was not very successful. I did not use any glue and the applique fabric was rolling on the background. If I need applique something I do it handy. I love your block Cindy! I really must try machine applique- I'm sure my machine could do it! Thanks for the chance to win a copy of the magazine! I don't do much machine applique these days. I use Pelon for stability with applique. Beautiful block. I have never done much applique, but this does inspire me. No machine applique, so looking forward to reading your posts to learn some tips myself! Congrats on the great block. I have done machine applique, although I'm a beginner so I would benefit from your tips!! I have not done much applique machine or by hand. Guess I will be getting out of my box in 2014 and give it whirl. Your block will be one I will need to try. Thanks! Love your block. My machine applique is all raw edge, just too impatient to fuss and fuse and turn edges! I am strictly a hand appliquer but I just saw a raw-edge block that I LOVE and now this! I will have to dip my toe in and try out both techniques. Yes, I have mainly done raw edge applique. I've either done raw edge applique or by hand. What a lovely giveaway. Congratulations Cindy, that's a very pretty block! I'm working on some machine applique now. The best tip i got is from jodi at tickle and hide, when doing zig zig stitch she sets the width to 2 and the length to 1 - it works perfectly! Great block! I have not tried machine applique yet--so far I've only appliqued a few blocks, and I did those by hand. Love how yours turned out. Thanks for the chance to win! Your block is great! Congrats! I do not do applique - but I might give it a go here after seeing all the applique pieces on this hop! thanks! Such a great block! So happy. I never did machine applique until now. I love the block!! I do machine applique and will be adding your block to my "to do" list. Thanks for sharing. I've done some machine applique, both raw edge and turned. I usually decide which one to use based on how complicated the shapes are and how much the quilt will be washed. I think a bit of applique added to a pieced quilt makes it really special. Congratulations on being a part of this magazine, it's always such a wonderful collection of blocks! I have never done machine applique. It is something I have wanted to add to my quilts. One day!! I love machine applique, there are so many possibilities with it. Your block is wonderful, I really like all of the movement. Yes. I've done machine appliqué. I like to use a small zig-zag stitch as it is easier to go around corners with it. I love your block! I am just finishing a doll quilt with the orange peels appliquéd onto it by hand. I have not done much applique, but what I have done is on the machine. Can't offer much advise as I am new at applique. Thanks so much for sharing your pretty block. I've done machine applique on a couple of BOM quilts. I've used a small zigzag and a blanket stitch. I love your block and all the settings you've shown! I've done raw edge machine applique. I usually use a button hole stitch and a clear presser foot, so I can see where I'm stitching. I have only done a little machine applique - and when I do, I try to use the tiniest stitch possible. Awesome colorful block! your block is great... I can see planning the fabrics to get a really good circle pattern.. can't wait to try. I enjoy hand applique more but for larger pieces I do go to the machine, my tip would be to tie off the back of your thread so it doesn't fray, just to be safe. Cute block, love the colors. I just started doing applique... mostly hand sewing, but would love to get the technique for machine applique... will check back here for posted tips..
That is a great block. I have just recently started a bit more machine applique. It has never been my favorite technique, but I love the look of it. Awesome block and love your layout!! I`ve never tried machine applique only hand applique though I need to improve it. I love your block! I see two different patterns when I look. Appliqué is not my thing although I have done quite a bit. Great block - I've done a few table runners with appliques, small projects. Circles are hard! Thanks for the give away! Very nice block... I don't do too much machine applique... mostly just quilting. Lovely block and it does look wonderful in a baby quilt! I've done a little machine applique and just recently did one using the buttonhole stitch. I have lots of learning to do. I love your Ring Around The Posy block. I've done a little machine appliqué and like you I plan to do more in the future. This is the first time I've visited your page but I will be back to visit many times but I must leave right now I'm on a mission to win a copy of QM's mag. Thanks for the chance to win. Congrats on making the magazine. I've just started with machine applique. I use a very small zigzag stitch and 60wt mono filament thread on turned edged applique. It does take some time, though, but the results are worth it. Great block! Congrats! I do machine applique all the time, love doing raw edge. Thanks for sharing your beautiful block and congrats on making the magazine. Bright and colourful....I have never done machine applique but do love needle turn! Very bright and colorful. I enjoy machine applique. Congrats on getting your block in Issue #8. Yes, I have done machine applique and really enjoy it a lot. No hints other than just to use a good fusible for your blocks. Thanks for chance to win. I do love your block... very pretty with all the colors. I love the design and the colors of your block. So bright and happy. Sorry, no special tips to offer you with regard to machine applique, but I have tried it, and it is fun to do! Congratulations on having your block published! 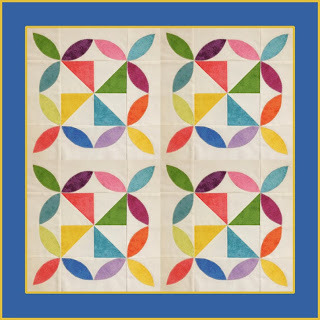 Congratulations on having your block published in Quiltmakers 100 Blocks Volume 8. It's a beautiful block and can't wait to make it. Thanks for the chance to win a copy of the magazine. I love machine applique, but still having a hard time on inside and outside corners. Maybe I should just give up and start doing it by hand. I have done a very small machine applique thing, love to do it by hand. That is also a start. So no tips ;-) Nice block! Thanks for the chance! I love those colorfull blocks. My fingers are crossed. I have not done machine applique before, but I have done buttonhole hand stitching, which is fun, too. I like your colorful block. I enjoy doing machine applique.Congrats on being chosen!! Such a colorful block - great design. I so enjoy machine and hand applique..Congradulations on getting your block in the magazine. I've done machine applique. One hint I can pass on, is to use a smaller needle especially with fusible applique so you leave a smaller hole. Yes, I have done a lot of machine applique..sometimes I use invisible thread and sometimes I use the blanket stitch..most of the time I turn the edges under before applique, especially if I know it will be washed.. I have done machine applique, but am never happy with the outcome. Practice, Practice! I have done machine appliqué although I prefer needle turn. I usually use a fusible with machine appliqué. I have done some machine applique and feel I just need more practice on turning corners! I pefer hand appliqué but have done some machine. I have all old machines (or should I say vintage) so I had to use a feather stitch for the appliqué but it worked and was fun to do. Sorry haven't done machine applique. Check out youtube for videos to help. Just by hand. As a recent quilter I don't feel that I'm up to machine quilting yet. The only way I applique is by machine! I have done it by machine and just go slow and very slow on corners! Congratulations! I haven't tried Applique either way but it's on my list.Thanks for this chance. Cute little block. I have tried machine applique and usually like the results. No advice to offer, other than to plan and take your time. I usually hand appliqué. I have done machine appliqué and one of the best hints I have seen is from Nancy Zieman. When you are stitching down the edges with zigzag or other stitch, reduce the stitch length when nearing points or corners. It makes it easier to stop at the corner without overshooting. I'm new to quilting but love the applique. I love your block because of the 2 different elements. Colors are great too. I would love to learn how to applique. So excited about this giveaway, congrats on getting into 100 Blocks. I've not done machine applique. Given how many decorative stitches are on my machine, I should give it a try. I've done machine applique - tip: keep the needle down selection engaged. I've grown partial to steam a seam raw edge appliqué with a zigzag stitch. I've never done any applique, but if I want to make your lovely block, I'll have to learn soon. Thanks. No I have never tried machine applique- not yet anyway. No. Never tried machine applique. Although, I have tried using machine embroidery stitches. I'm going to have to practice this big time before using them on a quilt! LOL. Congrats on getting into the magazine! Lovely block! I have only done a bit of machine applique so my best tip is to sew slowly along the curves and pivot more than less. I've not tried machine applique. I haven't done a lot of applique at all. But I've been very intrigued by it of late, especially the Boston Samplers that I've seen. I like to applique but I'm not so great at it. Machine applique with buttonhole stitch is my favorite applique method. My tip, make your buttonhole stitch smaller for tiny applique pieces. Machine applique is my favorite! Someday I may get brave and try hand turn. yes I've tried it but I'm not satisfied with my work. My curves are not smooth enough, the stitches to big or not big enough. But keep on trying. What a fun block! I love traditional applique, but recently took a class with Kim Diehl and loved the machine technique she uses (in all her books). Now maybe I can get to all those projects that I have been wanting to start! I haven't done a lot of machine applique (or any applique for that matter ^.^) I have tried it and need some practice before my work is presentable! I have done a little machine applique. Stabilizer is the key!! I have tried machine applique but I just don't do it very well...I guess you have to keep trying. What a fantastic block design! Congrats on the publication. Wow! I really love this block! I have done very little machine applique but I recently bought a leaf shape die for my studio cutter and your block really has my mind going on ways to use this. Thanks! Love , love, love it!! Congrats for making QM 100. I love doing machine applique. I just take my time, use different stitches to set things off and I also use ribbon, cord and others to accent them off. I have tried machine applique and really enjoy it. I like the options my machine has for diferent stiches and decorations! Your block is so cheery! I like the pinwheel in the center. Fun block! For machine applique, I use a good stabilizer, and ALWAYS make a practice piece and record the best stitch settings! What a colourful, cheery block. Just the block for a baby quilt. I prefer hand applique for the its relaxing nature but I have use machine applique too. I like it when the piece is going to be laundered often because it is well used as in baby and children's quilts. My best tips are use stabilizer and test out your stitch choice on a quilt sandwich the same as your quilt before beginning. Your block is so colorful and I just love it! I've done machine applique before and it is quite enjoyable. I can't think of any tricks to share other than use a good fusible web product. No, I have not ever machine quilted but I will some day. I have done machine applique, but with only a straight stitch, it is all wild kind of outlining. I think it is cute, for it gives a more homespun quality. Of course, I would never do that with an elegant quilt. I would pull out my old machine with a zigzag, or I would borrow my friend's machine with fancy stitches. Cute block! I have done several techniques for machine appliance including fusing for raw edge finishing, dryer sheet turning, machine zig zag...but my favorite with the best result is using clear thread and a very tiny catch stitch on a prepared turned edge. My best tip is to clean your machine before you start and use a new needle. love bright colors in quilts! Love your bright colors...I do a lot of scrappy quilts so I love color...I haven't done much applique but need to learn this technique!! 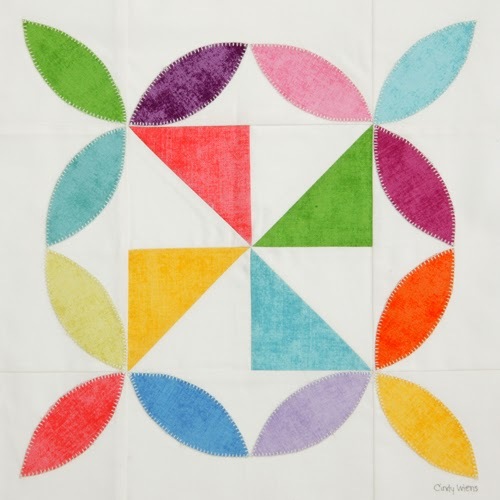 I have used machine applique when I needed to finish a quilt in a hurry. I start a new quilt with the intention of using the machine, but I keep reverting to hand applique. (I like to get comfy in bed and stitch while watching mindless TV.) I am going to try it again soon. I have not done much with machine applique - so I am not confident in anything I do. Living a Colorful Life is a good mantra. I love the block you designed for 100 Blocks. The only advice I have for machine applique is that I use a good water-soluable stabilizer and take my time sewing. I have not tried machine applique. Very cute block and I always like a rainbow quilt. I have done machine applique and a tip would be to use some sort of stabilizer for the back. I have heard that coffee filters work great but haven't had the chance to try them yet. I have done some machine applique, but prefer to do it by hand while watching TV. I love your block. 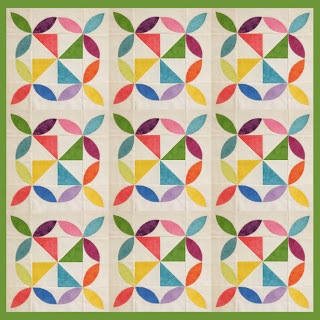 I am a big fan of pinwheels so I like this secondary pattern that it makes. Thank you for sharing and for the giveaway. I have done machine applique. I use Wonderunder on top and tear away stablizer on the bottom. Then I stitch by using a close satin stitch. I made a Halloween quilt with machine applique and loved it. I only used the blanket stitch and it worked really well for me. Beautiful, happy, cheerful! It's a block that looks so fun to make. I've done a little bit of machine applique and some hand applique but still need to practice! Congratulations on being included in the magazine. I have done applique by machine and usually for art or fun pieces. I just go for it and enjoy the process and try to watch my foot line so i can make sure the stitch stays as even as possible. I got a star foot to do machine applique, open foot and easier to see what you are doing. Your block is very pretty. It has been many years since I have done machine applique and have yet to use it in a quilt. I am going to do that soon as I see so many great quilts using it. I don't really have any hints for you as It has been a long time and I know much has changed in the way of stabilizers. I enjoy machine applique but haven't done much of it. I like your block! I have made several projects with machine applique. I am too impatient for hand applique. I am a beginner so as of yet I haven't tried applique yet. It is on my bucket list however! I have tried machine appliqué a few times. Usually using a buttonhole stitch. But I don't feel like I am particularly adept at it so no hints here. Ha! Machine applique is the only way I know how! Congratulations for being published! Ring Around the Posy is such fun a block! It would be a great quilt to work all my scraps into! I haven't tried any machine applique. Thanks for the chance to win! When I machine applique, I use a buttonhole stitch with contrasting thread, and people keep thinking I hand stitched it! I have only tried machine applique a few times. My tip is that when you come to a corner, leave your needle down and adjust the piece you are working on so the needle will go down the next time just where you want it to. Especially handy if you are doing a buttonhole stitch and you don't want the stitch to go past where you need to turn. Cute, cute block. I've done lots of machine applique as well as hand applique. I find with machine applique, I need to slow myself down occasionally. Also, make sure you are using a sharp needle. Relax and have fun with it. Try colors that you don't normally work with. Enjoy applique so much. Love your block. I like doing machine appliqué, your block is very bright and cheerful. I haven't done a lot of appliqué. but I have learned a few things. I've learned some sort of stabilizer is needed behind the fabric, especially if you're working with curves or circles. and fusible web is great! Really neat block, thanks for the chance! I've not yet attempted machine applique--though I always mean to try. Love your quirky block and you blog!! I do a lot of machine applique and use several different methods, depending on my mood and feeling for the quilt I am making. I have done machine applique. Don't rush and use good thread. Cute block. I haven't tried machine applique. I do hand applique and love it! I've done some machine applique. Need more practice, though! Whenever I do machine applique, I use a tear-away stabilizer behind it. It works great to keep the stitches from bunching. I also have tried Golden Threads quilting paper since I had it lying around, and used a tweezers to help remove it from small areas. Your block is so cute & bright; congrats! I have made a number of wall hangings using machine applique. - my favorite thing to do. I fuse a lightweight interfacing (usually used for sewing garments) on the back of my piece after the applique is fused to the square (or whatever shape) before doing the quilting. I really enjoy machine appliqué. I've only made a few quilts with appliqué, so the only thing I've learned is to use a really soft stabilizer or one that washes away. I love your block, especially the pinwheel in the middle. Thanks for the chance to win a copy of the magazine. First, congratulations on being chosen for the 100 blocks issue. I think your block is great since I enjoy both piecing and applique, by hand or machine. I especially like the different options you have given. It would certainly make a cute Christmas runner or wall hanging in reds, greens and gold. Beautiful work! I've done a little zig-zag-edge applique by machine ... I like a tight zig-zag (like a buttonhole) ... but I'm still working on my technique. Always learning! I've done a tiny bit of applique in a class using fancy thread, then.... last summer, while making a charity blanket, I broke my fancy stitch machine. Unfixable :( so I am left with my 1027 Pfaff which has never let me down in the 34 years I have had her. Not sure if she is good at applique, but I am willing to try :)! So love your bright block. I did some zigzag stitch applique many years ago, but it was rough looking! Your block is so sweet..I envision it in 1930's prints. I have tried some machine applique although I am not very good at it. I think I like the blanket stitch better than the satin stitch. I definitely need more practice! Love the block. I typically hand applique. I peice on my sewing machine, but hand sew everything else. I haven't tried it yet, but after seeing all the blocks on the tour I think I need to! Oh gosh! Love your block! It's gorgeous! Yes, it would make a beautiful baby quilt. I have done machine applique and by hand as well. I really enjoy doing handwork. My only tip would be go slow around curves and points, that's probably a no-brainer, hehe. 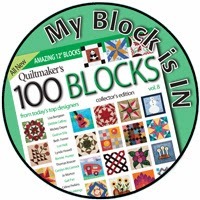 Congratulations on having your block included in Vol.8, Quiltmaker's 100. I did machine applique eons ago (well 13 years ago on a quilt for my first grandson. But I haven't done any recently. I love your bright colors. I do a lot of kids quilts and I always use bright primary colors. I'm pretty new to applique, but I can see how it can become addicting! Ohhhh, I love your block! I love any type of applique & have certainly done it by machine. I make sure I take my time & let nothing distract me. Thanks for a chance at the give-away. 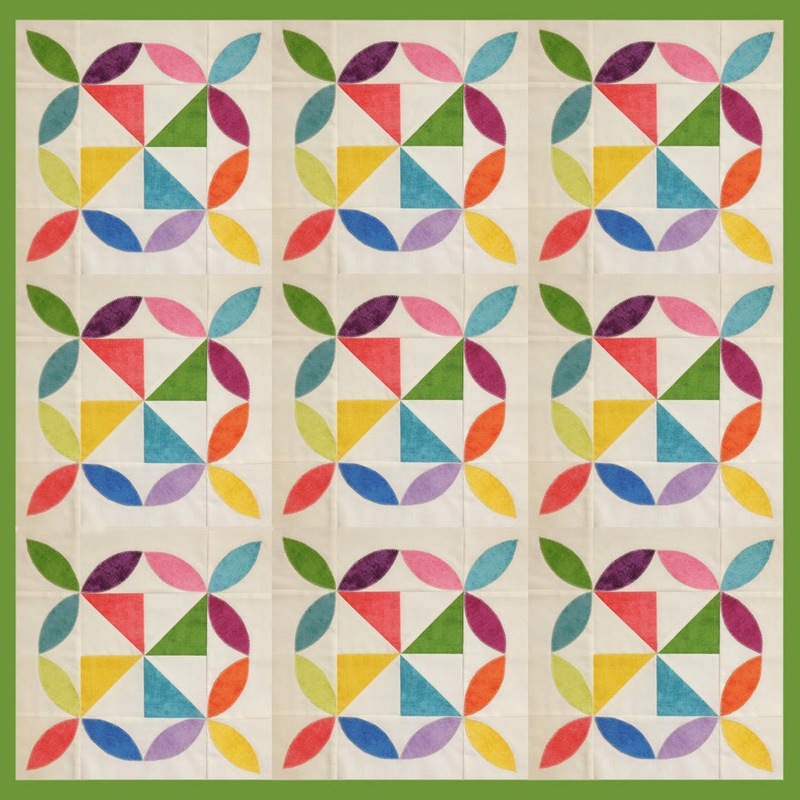 Love your quilt lay outs - that's a very cool block! I do lots of machine applique. My husband built me a simple light box and I use it to trace the pattern onto the double sided interfacing. I haven't tried it yet but love ur design! I love the different colors. I have just finished a king sized appliquéd flower quilt and practice makes it easier. I love the topic of the comments. Will be looking forward to going back and reading tips on machine appliqué. I spend more time undoing than "doing" when it comes to machine appliqué, so I'll be looking forward to picking up a pointer or two! Congrats on your block!!! Beautiful block! I have no tips as I have not done much applique. I haven't tried machine applique - I'm a hand "appliquer", but would love to try it now that I see how pretty your quilt block is. Can't believe it's done by machine! I use stabilizer when I do machine applique. It keeps the thread from "tunneling." Thanks for the giveaway. I have done a lot of machine applique. I like to use light wonder under. A good machine also helps. Embroidery thread also gives some extra texture and color. I have only done machine applique. I need instant satisfaction. You can make all the interesting and complicated shapes. I have never done machine appliqué, but your block is tempting me. Did you have to cut the background pieces a little bigger to accommodate any shrinkage? I have done all applique types, usually by machine I do blanket stitch or satin stitch. My advise is to use a stabilizer in the back, when finish you tear it away. Keep in mind that tiny pieces of paper will be under the thread of the blanket stitch. I take the time to take them out with tweezers. My machine applique took a turn when I bought a Pfaff CV that lifts the foot when you stop. It is a dream to applique. good luck. I have done machine applique. I have not been that successful when I used the zigzag stitch. I am getting better the more I do it. I love your block! I, too, love machine applique. If it couldn't be done by machine I don't think I would applique at all. But I so love the designs that can be made with applique - each design has a story to tell!